Welcome to the first day of Chocolate and Some Enchanted Islands* Theme Week. Cacao grows in many exotic and tropical isles near the sea. Being near water helps moderate the temperature (not too cold and not too hot); and being near the Equator (plus or minus 20 degrees Latitude) helps regulate the light and heat needed for temperate forests, plantations and farms—and cacao. First we'll visit a few islands in the Caribbean. 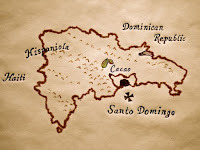 The Dominican Republic (DR) has gone by many names in the past—including Hispaniola, an island referenced in pirate tales long ago that was (and still is) joined with Haiti. 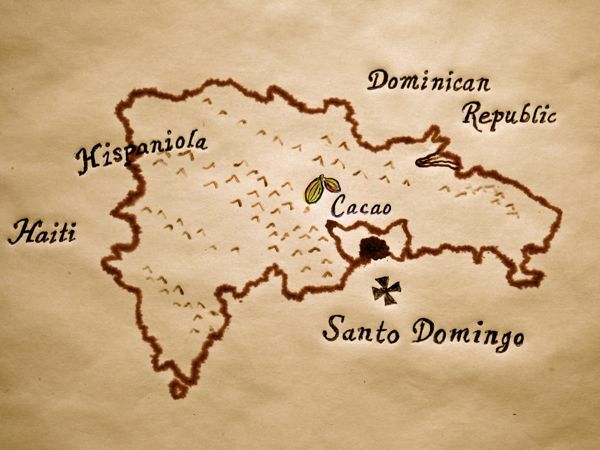 Europeans from Spain and other nations brought cacao to Caribbean islands, where it is still grown today. Santo Domingo is a large city, and the capital of the Dominican Republic. It's one of the oldest cities in the Americas. It's also the name of the surrounding province in the DR, where cacao is grown. 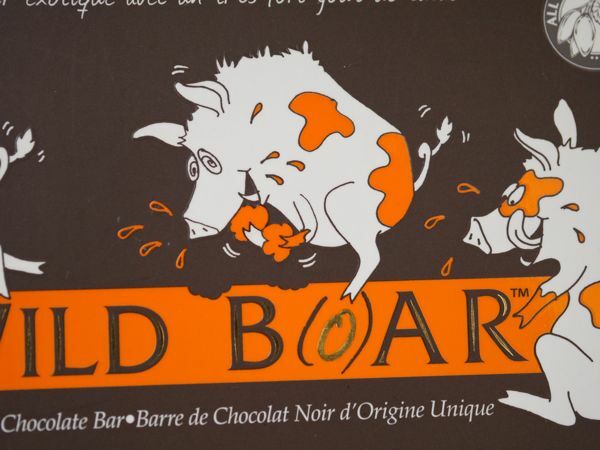 Today's 70% Cocoa Wild B(o)ar dark chocolate single origin bar was from Hagensborg Chocolates (Barnaby, British Columbia, Canada). 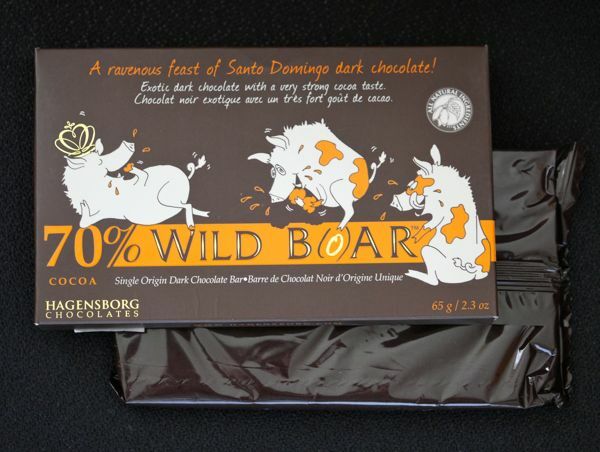 This Santo Domingo bar was made from cacao beans grown in the province of the same name, on the southern side of the DR. This province borders on the Caribbean Sea. The bar had a rich, smooth, consistent, and chocolatey aroma, flavor and texture. 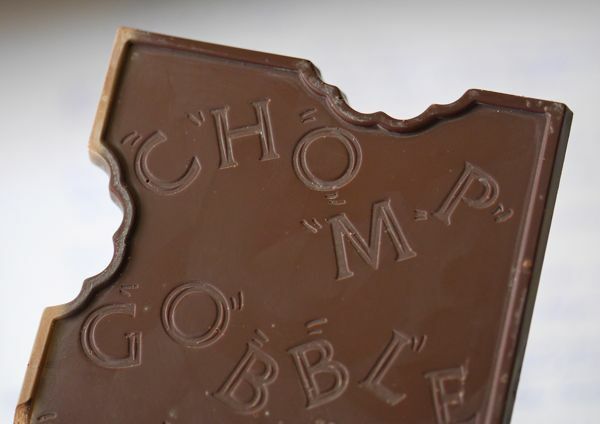 And pre-molded bite marks around the edge of this bar (possibly from a chocolate-eating pig on the same bar) made me smile. Hagensborg product packaging is just plain fun. 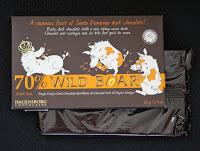 Cartoon pigs lounge, cavort and frolic across bars of Hagensborg chocolate (on printed packaging and on bars). Thank you Hagensborg for some lively levity. * Sing to the tune of "Some Enchanted Evening" from Rodgers and Hammerstein's South Pacific, if you'd like.